Draft: 2009, Texas Rangers, 14th rd. Resides in Knoxville, TN during the offseason with his wife, Allison, and son, Paxton ...Participated in the Tigers Winter Caravan and TigerFest...Earned Tennessee Community College Athletic Association Player of the Year and was First Team AllTCCAA as a sophomore at Walters State in 2009 after posting an 8-1 record with a 2.08 ERA (65.0IP/15ER) and 78 strikeouts in 12 starts. Saw the first Major League action of his career in 2017, appearing in 28 games, including four starts, with Detroit...Began the season with Triple A Toledo, where he posted a 1-2 record with a 1.25 ERA (21.2IP/3ER) and 25 strikeouts in four starts during April...Made his Major League debut on May 10 at Arizona and struck out Jake Lamb in the eighth inning for his first Major League strikeout...Did not allow a run in the first four appearances of his Major League career, throwing 7.2 consecutive scoreless innings... Made his first career Major League start on September 3 vs. Cleveland, allowing five runs, on eight hits, with a strikeout in 4.0 innings. Began the 2016 season in the Texas Rangers organization, before being acquired by the Tigers on May 3...Combined to pitch in 33 games, including 12 starts, between Triple A Round Rock and Triple A Toledo and had an 11-4 record with a 3.29 ERA (98.1IP/36ER) and 88 strikeouts...Placed on temporarily inactive list from April 24-30...Made five appearances, including two starts, during April and posted a 1-0 record with a 1.50 ERA (18.0IP/3ER) and 19 strikeouts... Threw a season-high 6.0 shutout innings on May 29 vs. Buffalo -- also pitched 6.0 scoreless innings on June 22 at Scranton/Wilkes-Barre and September 1 at Columbus... Named International League Pitcher of the Week for the week ending May 29 -- started two games during the week and had a 1-0 record with a 0.00 ERA (11.0IP/0ER) and eight strikeouts... Placed on temporarily inactive list from June 2-5...Earned the win in three consecutive relief appearances from July 9-21 -- pitched 3.0 scoreless innings on July 9 vs. Louisville, 2.0 shutout innings on July 18 vs. Pawtucket and 2.2 scoreless innings on July 21 at Norfolk. • Had his contract purchased by the Tigers on November 4. 2 de noviembre de 2018 LHP Chad Bell elected free agency. 18 de septiembre de 2018 Gwinnett Stripers activated LHP Chad Bell from the 7-day disabled list. 29 de agosto de 2018 Gwinnett Stripers placed LHP Chad Bell on the 7-day disabled list retroactive to August 27, 2018. 20 de agosto de 2018 Atlanta Braves sent LHP Chad Bell outright to Gwinnett Stripers. 11 de agosto de 2018 Atlanta Braves optioned LHP Chad Bell to Gwinnett Stripers. 10 de agosto de 2018 Atlanta Braves recalled Chad Bell from Gwinnett Stripers. 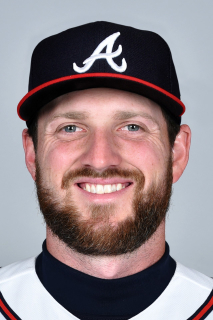 15 de mayo de 2018 Atlanta Braves claimed LHP Chad Bell off waivers from Detroit Tigers. 15 de mayo de 2018 Atlanta Braves optioned LHP Chad Bell to Gwinnett Stripers. 12 de mayo de 2018 Detroit Tigers designated LHP Chad Bell for assignment. 3 de mayo de 2018 Detroit Tigers optioned LHP Chad Bell to Toledo Mud Hens. 30 de abril de 2018 Detroit Tigers recalled Chad Bell from Toledo Mud Hens. 19 de abril de 2018 Detroit Tigers optioned LHP Chad Bell to Toledo Mud Hens. 12 de abril de 2018 Detroit Tigers recalled Chad Bell from Toledo Mud Hens. 22 de marzo de 2018 Detroit Tigers optioned LHP Chad Bell to Toledo Mud Hens. 3 de septiembre de 2017 Detroit Tigers recalled Chad Bell from Toledo Mud Hens. 24 de agosto de 2017 Detroit Tigers optioned LHP Chad Bell to Toledo Mud Hens. 11 de junio de 2017 Detroit Tigers recalled Chad Bell from Toledo Mud Hens. 27 de mayo de 2017 Detroit Tigers optioned LHP Chad Bell to Toledo Mud Hens. 1 de mayo de 2017 Detroit Tigers recalled Chad Bell from Toledo Mud Hens. 18 de marzo de 2017 Detroit Tigers optioned LHP Chad Bell to Toledo Mud Hens. 4 de noviembre de 2016 Detroit Tigers selected the contract of Chad Bell from Toledo Mud Hens. 4 de mayo de 2016 LHP Chad Bell assigned to Toledo Mud Hens. 3 de mayo de 2016 Detroit Tigers traded C Bobby Wilson to Texas Rangers for LHP Chad Bell. 1 de mayo de 2016 Round Rock Express activated LHP Chad Bell from the temporarily inactive list. 30 de abril de 2016 Round Rock Express activated LHP Chad Bell from the temporarily inactive list. 24 de abril de 2016 Round Rock Express placed LHP Chad Bell on the temporarily inactive list. 29 de marzo de 2016 LHP Chad Bell assigned to Round Rock Express from Frisco RoughRiders. 17 de marzo de 2016 LHP Chad Bell assigned to Texas Rangers. 3 de agosto de 2015 Frisco RoughRiders activated LHP Chad Bell from the temporarily inactive list. 30 de julio de 2015 Frisco RoughRiders placed LHP Chad Bell on the temporarily inactive list. 5 de mayo de 2015 Frisco RoughRiders activated LHP Chad Bell from the temporarily inactive list. 30 de abril de 2015 Frisco RoughRiders placed LHP Chad Bell on the temporarily inactive list. 31 de marzo de 2015 LHP Chad Bell assigned to Frisco RoughRiders from High Desert Mavericks. 6 de marzo de 2015 LHP Chad Bell assigned to Texas Rangers. 19 de junio de 2014 Chad Bell assigned to Myrtle Beach Pelicans from Hickory Crawdads. 18 de mayo de 2014 LHP Chad Bell assigned to Hickory Crawdads from Round Rock Express. 15 de mayo de 2014 Round Rock Express placed LHP Chad Bell on the temporarily inactive list. 13 de mayo de 2014 LHP Chad Bell assigned to Round Rock Express. 27 de septiembre de 2013 Round Rock Express activated LHP Chad Bell from the 7-day disabled list. 4 de abril de 2013 Round Rock Express placed LHP Chad Bell on the 7-day disabled list. 23 de febrero de 2013 LHP Chad Bell assigned to Texas Rangers. 14 de octubre de 2012 LHP Chad Bell assigned to Tigres del Licey. 22 de junio de 2012 LHP Chad Bell assigned to Round Rock Express from Frisco RoughRiders. 24 de abril de 2012 Chad Bell assigned to Frisco RoughRiders from Myrtle Beach Pelicans. 4 de abril de 2012 Chad Bell assigned to Frisco RoughRiders from Myrtle Beach Pelicans. 29 de marzo de 2012 LHP Chad Bell assigned to Texas Rangers. 31 de marzo de 2011 Chad Bell assigned to Myrtle Beach Pelicans from Hickory Crawdads. 2 de agosto de 2010 Chad Bell assigned to Hickory Crawdads from Spokane Indians. 22 de junio de 2010 Chad Bell assigned to Spokane Indians from Hickory Crawdads. 5 de abril de 2010 Hickory Crawdads signed free agent Chad Bell.